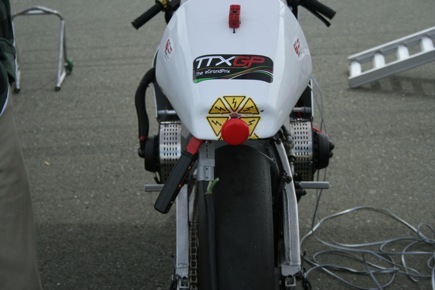 Coming from their victory at the 2009 Isle of Man TTXGP Zero/Agni put up a formidable and balanced showing. 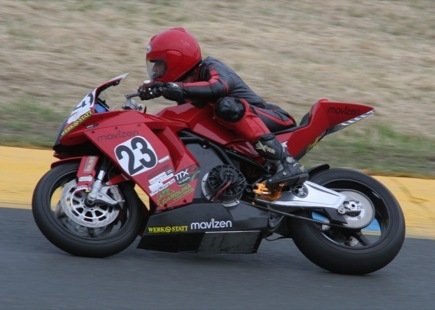 The combination of an excellent rider, a good-handling bike with a balance of power, battery capacity and thermal management allowed them a handy victory. The large rectangular Molicel battery pack is mounted oblique in the frame. 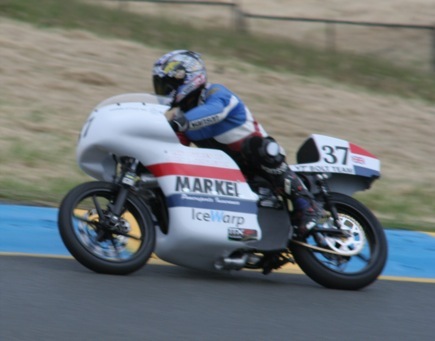 With the composite fairing installed the rider appears to rest almost flat on top of it. 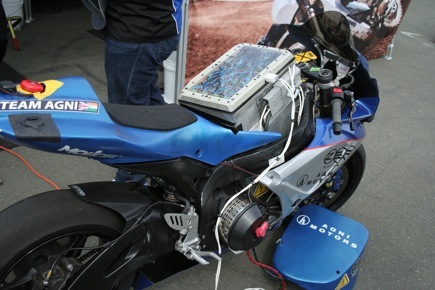 Molicel supplies batteries for Zero’s production bikes. Looks like an analog balancing system. I don’t believe I’ve see this system before. Dual Agni Lynch motors coupled directly with a steel shaft with sprocket. 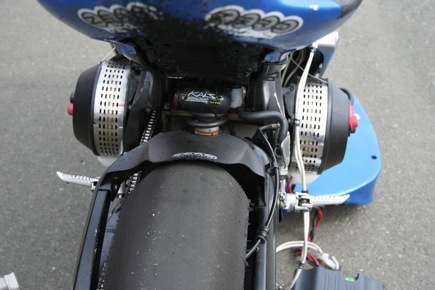 Adequate power, good cooling from outboard mounting and ram-air scoops taken from the production bike. The Zero/Agni team ran a very clean and uneventful race. 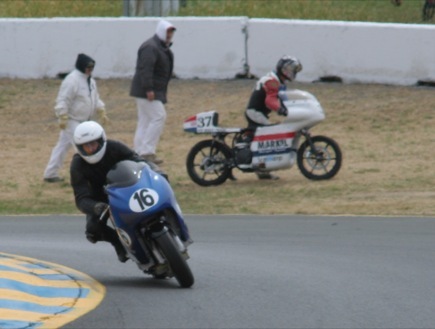 Their bike clearly balances proven reliability and performance. 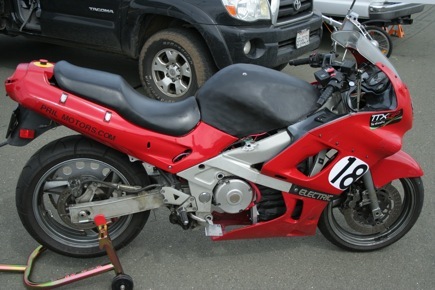 This was my favorite bike at the event, I think they’re really a team to watch. 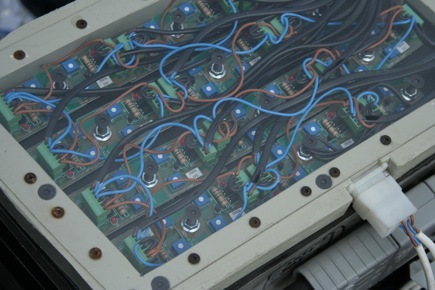 While teams building an electric vehicle are often required to do some custom design of battery packs or management systems, there are several off the shelf solutions for motor drive and transmission. Every other bike used one of these off the shelf drive systems. 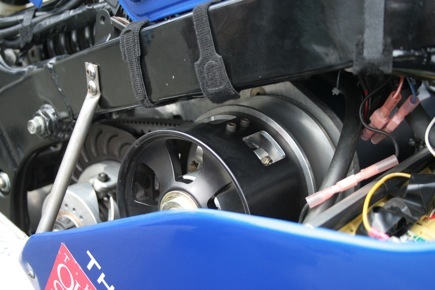 These guys however put together a one-of-a-kind drive using an EV-1 induction motor. The story I’ve heard goes like this: several years ago someone in the EV community found the GM parts department number for the EV-1 motor and transaxle and tried ordering one from a GM dealer. It was shipped to the dealer and was able to be purchased just like any other GM part. Several members of the EV in-crowd then proceded to buy as many as they could, until the stock ran out or GM wised up to what was going on and shut off the supply. I believe they managed to get a hold of sixteen or seventeen motors. Last I heard not all of them have been installed but the folks who hold them are very protective, because they are fantastic motors, rare, and hold a special emotional importance with the EV-1 connection. Anyways, the EV-1 drive system was capable of 100kw. Without official numbers I would guess the Lightning bike was running near that, maybe more. 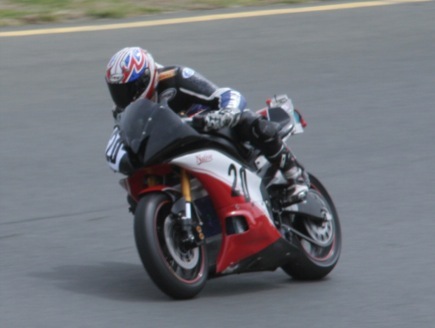 Suffice it to say the bike was fast. Extremely fast. 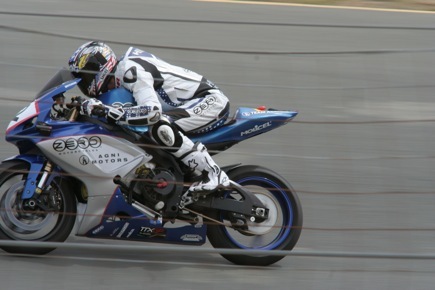 For the first half of the race the Zero/Agni bike would pull ahead with far superior corner speed then the Lightning bike would effortlessly pull ahead in the straights with its massive power. Massive power comes at a cost though, the second half of the race saw drastically reduced power that left Lightning playing catch-up continuously. I didn’t get the official word on the cause of the slow-down, I expect it was a combination of heat buildup and battery depletion. 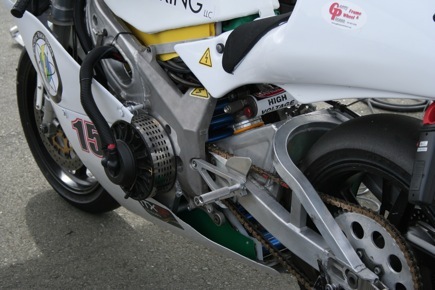 The rider actually stopped the bike near the end of the race to attempt to let the systems cool down. 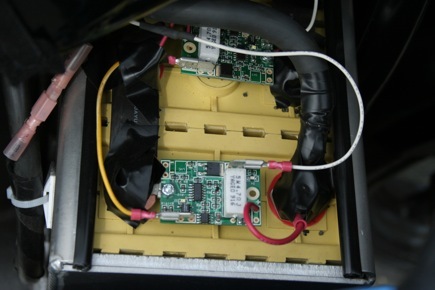 Both the Lightning inverter and motor are liquid-cooled, in fact the motor even has an oil cooling circuit as well. It was the only bike with plumbing. I observed their radiator up front, looked about 10″ x 18″. Given the insane power levels they were running I’m not surprised they had heat buildup issues. It’s possible they were also having battery heating issues, but with enough A123 batteries to power through a 25 mile race I bet they weren’t pushing the C rating, already very high for the A123s. As well, the batteries perform better warm. They’re running a Elithion Lithiumate BMS with 7 banks used- likely indicating usage of somewhere between 56 and 112 series cells- no more than 370v nominal. Considering the EV1’s nominal voltage of 311, they’re probably running closer to 112 series cells than 56. Drive was accomplished with a two stage reduction, first stage timing belt, second stage chain. PFC50 to charge. The rear of the EV1 motor can be (barely) seen here. I was curious about the specifics of the inverter. It’s nothing I have seen on the market. I was unable to get a clear answer about its origin or prototype/production status. I would guess that the main sponsor of the team designed it and is considering marketing something like it. They did tell me it’s based on IGBT modules. Uses a 4 quadrant full vector control algorithm. They have installed a custom quadrature encoder on the motor to replace the GM specified one. I believe with better handling or better driving, better thermal management and moderated energy usage this bike could win the race. It’s incredible power early on was seriously inspiring. 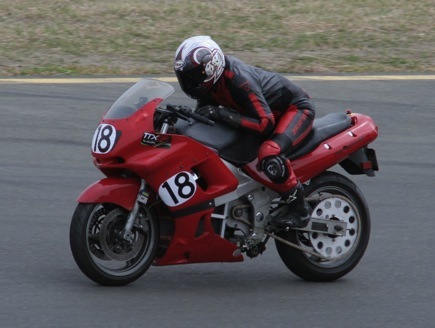 This bike had a similar setup to the winning bike, with dual outboard mounted, shaft coupled Agni motors, allowing a fairly high-ratio single reduction. 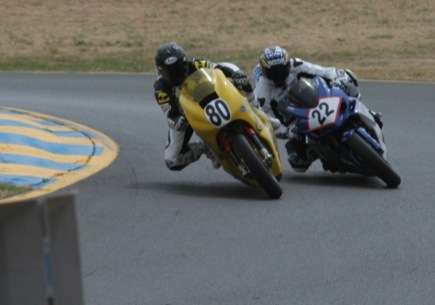 The bike was quick and reliable, leading to a respectable third place finish. I was interested to see that they appear to be running Headway LiFePO4 batteries. At least, that’s the only battery I’m aware of that is about that size in a shiny blue foil wrap. If there’s a recipe for success in this race it would seem to currently be the dual Agni setup. 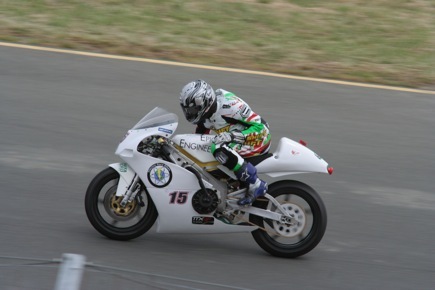 Despite an odd hiccup in the first lap, Werkstatt came in first of the two production-based bikes racing. The Mavizen TTX02 is a very impressive machine, with the polish that comes with a professionally designed product. Again with the dual Lynch motors. Recipe for success indeed. Coming in next after but significantly behind the big Mavizen is the Zero S based K Squared bike. 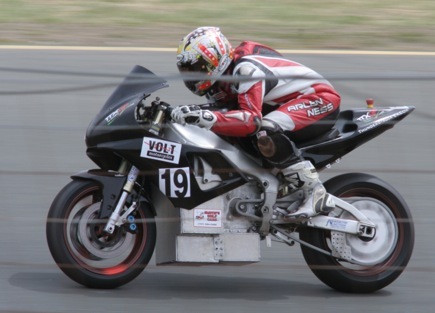 With its small size an weight the K Squared bike ran a good race. There’s no doubt the Zero S is a very capable machine. 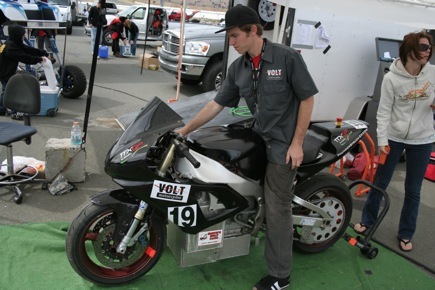 The Pril Motors team made up for less high-dollar components with reliability and solid driving. 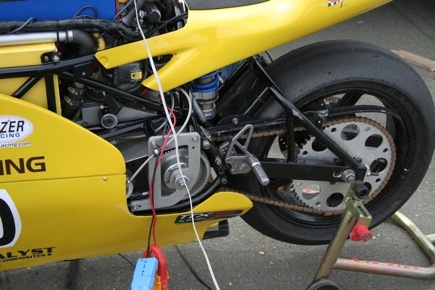 This bike is the only one represented in the race using a sep-ex DC motor (in fact, only team using anything besides induction or brushed permag), a 6.7″ size. Single speed chain reduction necessitates the gigantic rear sprocket, but is more efficient than double reductions. According to their website they are using pouch type LiFePO4 batteries. From the file of “interesting drivetrain ideas that might not actually end up being the best, but impressive nonetheless” comes the Square Wave bike. Using a belt CVT primary drive enables the high-ratio secondary chain but is less efficient than direct drive, and as demonstrated by every other bike there, largely unnecessary. 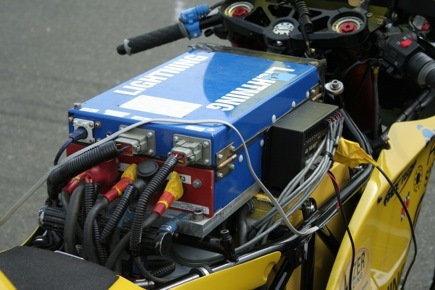 Thunder-Sky batteries are not usually thought of as good racing batteries, but that’s because most modern EV racing is drag racing, not time-trial. Thunder-sky batteries are supposed to be good to 3c (reports vary about the accuracy of the manufacturer’s 10c pulse claims, some even cite unacceptable sag under 3c draw). 3C draw will drain a battery in 1/3 hour, or 20 minutes. The race lasts longer than that, so assuming constant 3c usage, you should be able to use your entire TS battery capacity. 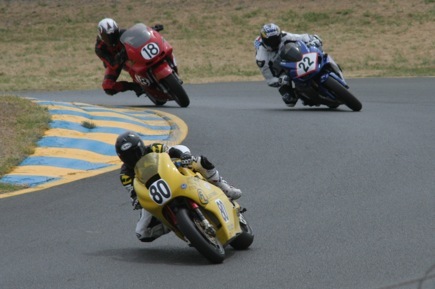 That’s not entirely the racing reality, you need to let off sometimes, and you need higher peak power for acceleration. However, it is worth taking into account the importance of capacity alongside power density in selecting a battery for a longer race. 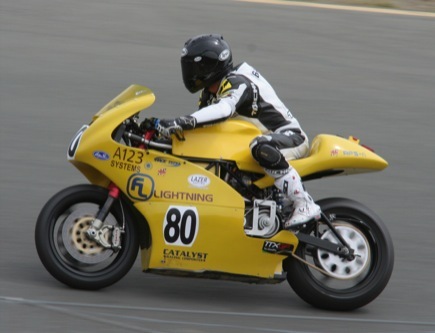 The Square Wave bike was outfitted with 90AH thunder-sky batteries, the 6.7″ C-face induction motor usually sold with the Curtis inverters, and a Curtis 1236 inverter. It ran the whole race, but was very slow. 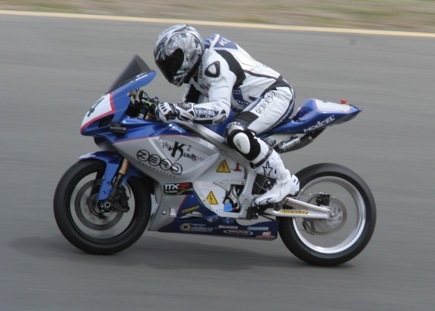 Reliability problems plagued the Electric Motorsport bike. Curtis 1238 inverter. TS or Sky-energy looking batteries, except in teal. Not sure what brand. 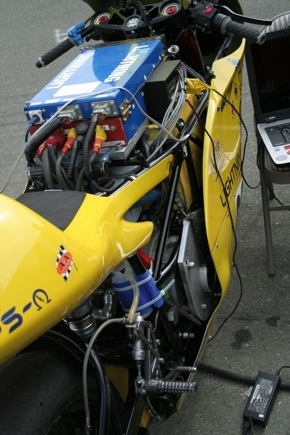 Reliability problems also for the Thunderstruck-EV sponsored Volt Motors bike. Curtis Induction setup again, with single reduction, big-sprocket rear end. 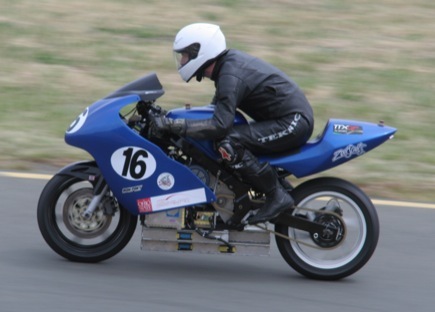 Even with awesome vintage cafe racer looks, built on a vintage Norton frame, with LiFePO4 batteries and induction drive system the Electra team ended up breaking down fatally mid-race. Hopefully they will be better sorted next time. The SWIGZ.com pro team and Bob Schneeveis’s Empirical Electric team didn’t make it into the race. Overall the race was extremely impressive. 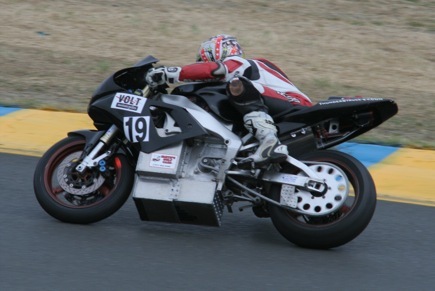 I have great respect for the TTXGP organization and every team who makes it out to run this race. It’s exciting to see electric vehicles make it back onto the road track in this new era of affordable and high performance lithium batteries and many high power and efficiency drive systems. 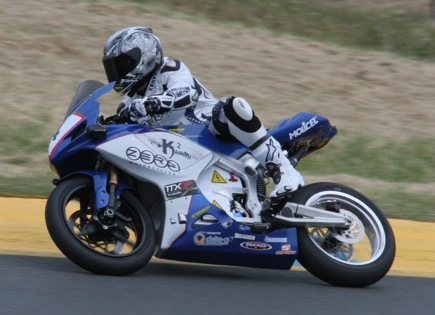 The TTXGP organization is providing a venue for advancing EV racing from hobby to professional, and while there aren’t enough teams with big resources and sponsorship to fill a race I’m sure it will grow. But in its infancy it’s a great opportunity for newcomers to experiment with technology and inventive solutions- there’s not really a “killer app” yet, it’s possible to have hugely different bikes competing neck and neck. And that’s pretty neat. Please let me know if I’ve got any facts wrong! Also, contact me for higher resolution photos. Photos taken with Canon Digital Rebel XT and Pentax 300mm/f4 lens. 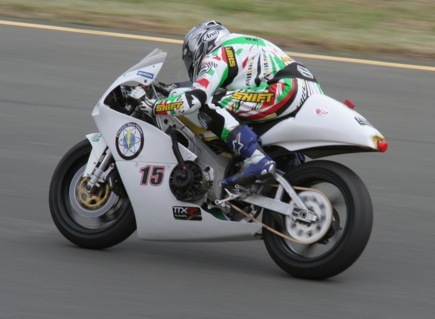 Thanks to Plugbike for the race results.